The Roca&apos; is a luxury, hand-crafted, South American polo belt from Pampeano. Featuring pampeano&apos;s iconic pampa diamonds, the instantly recognizable coloured blocks of this polo belt have been hand-woven using classic navy, grey and white wax-dipped threads. These signature threads are thick and robust saddlery threads, originally used for pampeano&apos;s technical polo equipment on the polo fields of Argentina. They have been coated in wax to ensure that they glide through the leather, do not fray or tear, remain vibrant in colour and are easy to clean. The rich colour of the Havana brown leather contrasts beautifully against the hand-woven threads, creating an iconic design that is eye-catching, instantly recognizable and undeniably pampeano. pampeano&apos;s leather is of the highest grade, hand-selected in Argentina by highly skilled craftsmen for its thickness, smooth surface and perfect quality. It is then vegetable-tanned and tumbled in a lengthy and traditional process using natural dyes which creates exquisite, buttery results. As the leather ages, it warms and softens, only improving with time. The iconic pampa&apos; designs are synonymous with Pampeano. 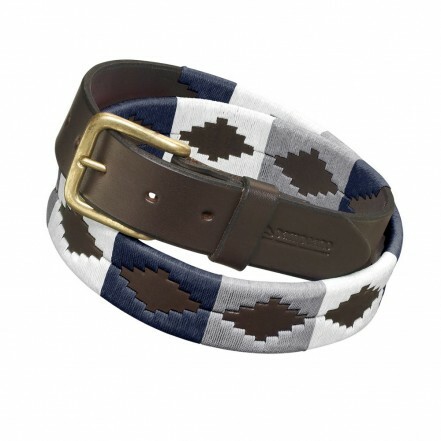 Originally used to provide polo teams with their team colours during matches, these polo belt patterns are a traditional example of South American artistry. Completed by local master artisans using a hand-process which cannot be replicated by machine, the Aztec diamonds were first inspired by the peaks and troughs of the Andes Mountains and the stunning landscapes which surround them. To this day, pampeano&apos;s South American artisans still hand-weave each pampeano polo belt, in a meticulous process which takes up to five hours to complete each one. The high quality, natural materials used to hand-craft the Roca polo belt means that it has been made to last. To keep it looking at its best, it is important to keep your polo belt clean and nourished. Use Pampeano&apos;s leather cream to keep the surface enriched and use a soapy, non-coloured sponge to scrub the threads in the direction of the stitching, before using a damp cloth to rinse and a dry towel to blot the threads to dry. The Roca measures 3.5cm wide.